The characteristics of a Japanese garden are simple, clean lines accented with bold colors, most often with a dominant red. It’s been said that the Japanese garden is never done, it’s always a work in progress. The basic framework to get started consists of textures, colors, and foliage indigenous to Japan. 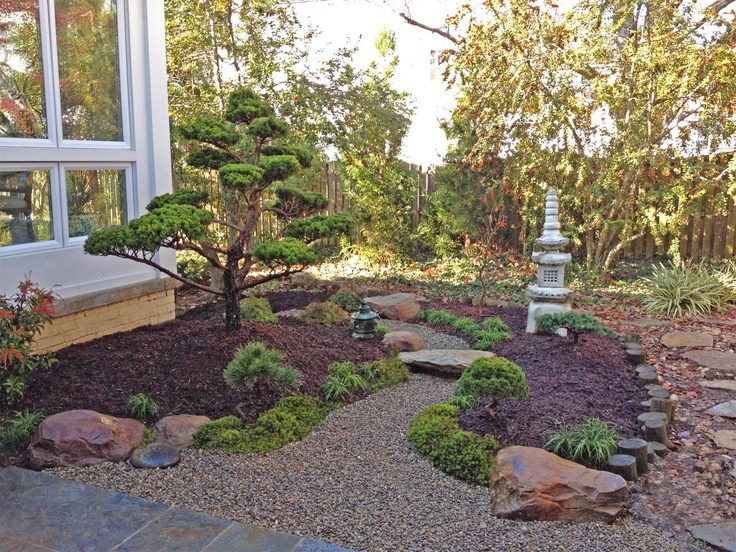 These gardens work well on any scale, from using the entire yard to building a small Zen corner for a quiet retreat. Try bamboo hedging to accent a large tree or isolate your Japanese section. Bamboo may also be used to compliment an existing waterfall by replacing a traditional spigot with one made of a hollow bamboo shoot. Garden foliage would not be complete without the bonsai tree, which comes in all shapes, sizes and colors. For bonsai beginners, the juniper species, in shades of green, is the easiest to shape and maintain. Juniper miniatures start and 4 inches and go up to the 18 inch Karate Kid species. For color accents, try some blossoming bonsai such as the flowering weeping Barbados cherry for hues of red and pink. For a darker colored Japanese plant, the acer not only adds color, but texture contrast to the bonsai with it’s light, feathery body in rich tones of burgundy and magenta. In addition to organic materials, Japanese gardens are characterized by water and bridges, which can be built on a large, functional scale, or miniatures in your Oriental corner. Adding lanterns and statuary bring your garden to life with your distinct personality.To develop your own game plan, try the how-to guide “Create Your Own Japanese Garden”, by Motomi Oguchi. 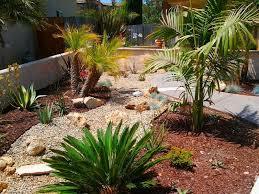 The overall effect of this landscaping choice is a neat and tidy yard, rich with color and culture. Desert gardens, also known as Xeriscaping, are ideal for parched terrain in need of drought-friendly foliage. 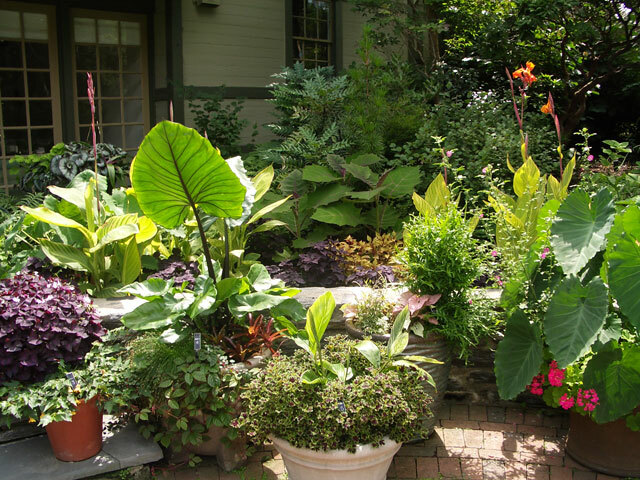 There are plenty of colorful shrubs and flowers that need little to no maintenance, bringing your space to life with breathtaking color. For sectioning a desert yard, try oleander which grows to 20 feet high. This plant makes a good hedge or divider, while adding a splash of color. Other vibrant choices include purple sage, which needs an occasional trim, but to keep the purple buds, trim your sage when it’s not in bloom. For yellow, orange and pink accents, lantana grows well in the desert. Another ideal choice is the fairy duster, a heat-friendly evergreen that grows at lightning speed and are a favorite for artistic gardeners to sculpt their own designs. For a low maintenance grassy-green look, try pampas grass to line your hedges or encircle a pool. Also, the bougainvillea is a great way to colorize a trellis or add a blooming vine to the fence. Southwest garden statuary and decor adds that final touch to a desert oasis. For a whimsical flair, try some Kokopeli iron works to dance among the oleander. Native American pottery, sundials and wagon wheels refresh the garden with an Old West feel. And for complete instructions on caring for your desert garden, try the foremost authority book on the matter called Desert-Gardening. For the island or jungle expression, look for wide, leafy leaves and palms, planting them close together for that lushly vegetated feel. Bamboo and lacquered wood add that special island expression and, of, course you’ll add the waterfalls. To compliment your furniture, try hanging planters with plenty of frilly fronds. One backyard palm tree is sufficient and could be encircled with canne lilies, hibiscus, jasmine and henna, for that special tropical scent. Knowledge is power, and to jumpstart the learning process, The Tropical-Look Encyclopedia is a must read for anyone interested in tropical plants. Don’t feel your backyard is big enough to be given serious consideration for a major landscaping project?